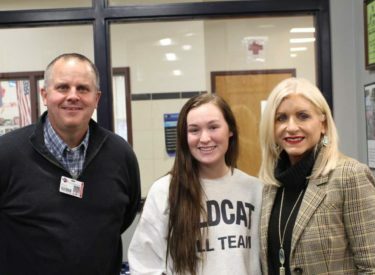 Superintendent Arrott and Po-Hi Principal Thad Dilbeck presented Haley with a “Wildcat of the Week” T-shirt from Boss Custom T-shirts, a Wildcat window decal, and a gift certificate from Ground Round. Each week a new “Wildcat of the Week” will be selected from the nominations of TEAM Radio listeners and viewers. Winners will receive a free meal from Ground Round and a T-shirt from Boss Custom Tees. Ponca City Public Schools will make the presentation weekly at Po-Hi.